SoundmodoIn this Gizmodo series, we find out what things sound, sounded, and would sound like. On July 16, 1945, scientists first unleashed the energy stored at the center of the atomic nucleus, causing a massive explosion in the New Mexican desert. That bomb’s successors would kill several hundred thousand people, permanently alter the course of international relations, and instill a constant sense of fear across the world for the following generations. What did these nuclear blasts sound like? Explosions all sound pretty similar, Spriggs explained. It’s just a shock wave—the blast deposits an enormous amount of energy into the air, causing a pulse that travels faster than the speed of sound. This shock wave charges forward, and in many test videos you can watch it travel along the ground until it reaches the viewer. With the shock wave comes the roaring booming sound. 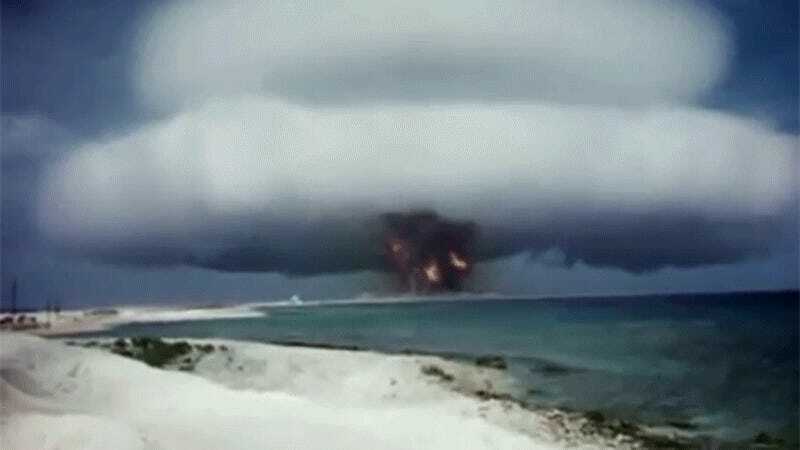 Nuclear blasts aren’t ordinary bombs, of course—the largest nuclear explosion ever, Russia’s Tsar Bomba, yielded 50 megatons of TNT worth of energy. That’s approximately (though not exactly) the yield of 50 billion kilograms of the explosive TNT exploding at once. If a human were somehow able to survive the heat of the explosion, the shockwave itself would burst their ear drums and the quick pressure change would cause lethal damage to hollow organs like the lungs and stomach. The shock wave doesn’t hit you at the same time that you see the blast, since sound travels far slower than light, Spriggs explained. Typically, sound travels around 0.2 miles per second, so the sound from a blast two miles away would reach an observer after about 10 seconds. But a nuclear blast’s initial shock wave can travel around a hundred times the speed of sound, before quickly slowing down and decaying, reaching an observer perhaps after five or six seconds, he said. You can hear it for yourself, in fact. While many of the blasts, including the first Trinity test, were only recorded on film, at least one test in the Nevada desert came with audio as well, and was preserved on the National Archive. Let’s hope that no one has to hear such a sound again. Hey, Has Anyone Seen Russia&apos;s Allegedly Missing Nuclear-Powered Missile?